If Oscar Valdez had dominated Miguel Marriaga, promoter Bob Arum wouldn’t have been able to bring back Marriaga to face Vasyl Lomachenko in his next fight. Marriaga made Valdez earn his unanimous-decision win, though, which is among the reasons Arum and his matchmakers deemed Marriaga an acceptable opponent for Lomachenko once a preferred rematch with Orlando Salido fell through. Ukraine’s Lomachenko (8-1, 6 KOs) is heavily favored to beat Colombia’s Marriaga (25-2, 21 KOs), who has moved up from featherweight to super featherweight to challenge Lomachenko for his WBO 130-pound championship Saturday night. Marriaga’s 12-round loss to Mexico’s Valdez (22-0, 19 KOs) on April 22 in Carson, California, was largely considered closer than the scorecards suggested (119-108, 118-109, 116-111). 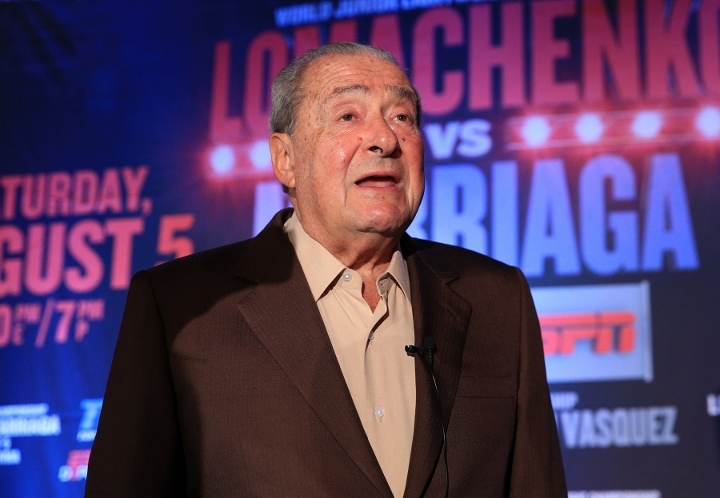 Arum made his case during a press conference Thursday as to why Marriaga earned his second straight title shot in a scheduled 12-round fight ESPN will televise from Microsoft Theater in Los Angeles. “UFC has taught us that a loss is not a death sentence,” Arum said. “If a guy loses a fight, but he loses heroically and he gives a hundred percent, people wanna see him fight again and you can bring him back again. He lost the fight to Valdez, but he fought a very, very courageous fight. It was close and he fought a very courageous fight. The Lomachenko-Marriaga match will headline an ESPN doubleheader set to begin at 10 p.m. ET/7 p.m. PT on Saturday night. The telecast will start with a 10-round lightweight bout between Phoenix’s Ray Beltran (33-7-1, 21 KOs, 1 NC) and Costa Rica’s Bryan Vasquez (35-2, 19 KOs). Look a loss shouldn't mean the end of a top career but a fighter should have to earn a title shot.